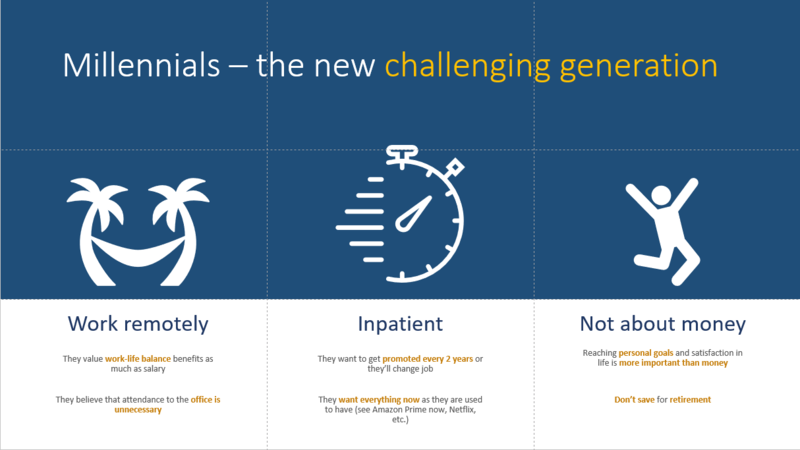 You’re preparing another presentation, yet you know that PowerPoint is an essential part of the job, and you face the same questions that plagued your previous presentations: Are these slides too full? 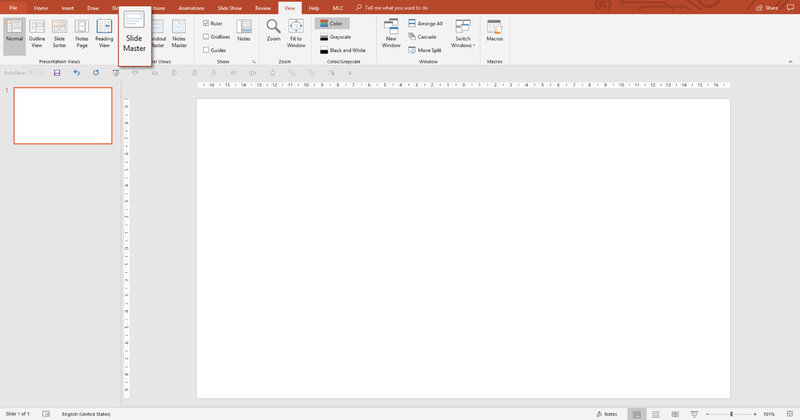 Isn’t there a trick for creating an effective presentation in PowerPoint that I could easily implement? I took a ride on slideshare and I found a presentation by Deloitte, which I will use as an example of overcrowding a slide. Have you looked at it? It’s there in front of you, so it’s hard not to look. This is what you subject your audience to each time you show them a slide. People can do one thing properly at a time, so if they look at your slide, they’re probably not listening to you anymore. How much time elapses between when you start to look at the slide and when the audience comes back to look at you and pay attention to you again? That is, how long are they not listening to your presentation, their attention too caught up in the slides? Looking at the Deloitte slide, did you feel that you were facing a wall of information that looked the same, without knowing where to start reading? If yes, do not worry, as that is a normal reaction. 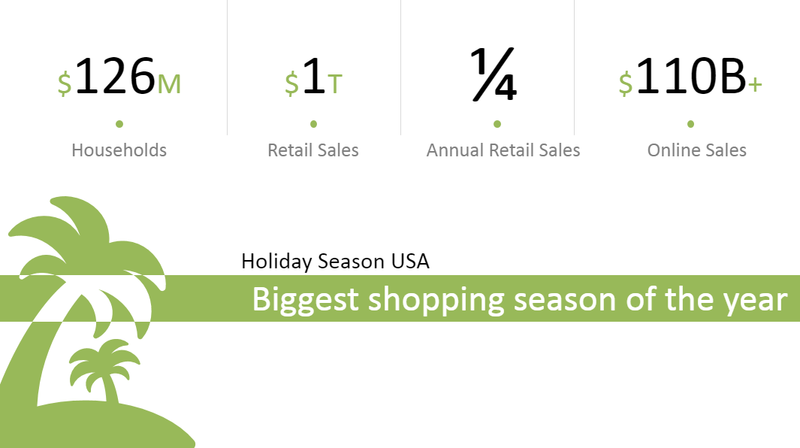 This slide is built on a layout that is not optimized for the content it’s presenting. 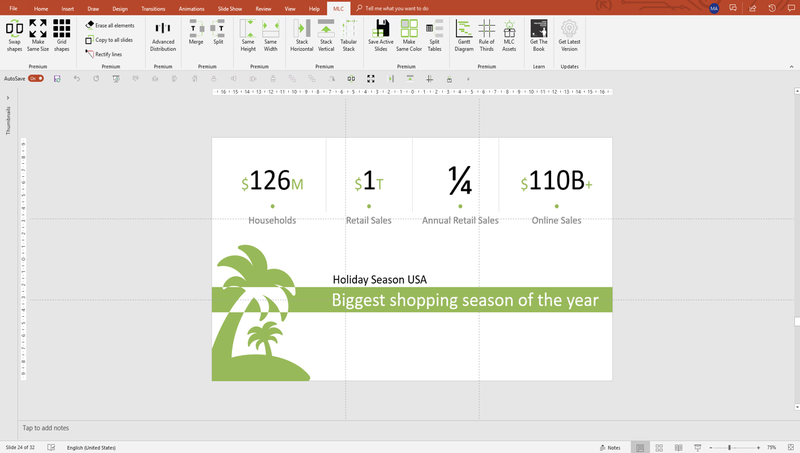 I am sure that the layout was chosen from among the layouts available in the slide master (Check Microsoft PowerPoint Slide Master tutorial and save time on your presentations). You can see that the fields have been kept: title and subtitle. If it’s possible, you removed the placeholders and added the contents of the 4 colored boxes by hand. The problem lies in the fact that we try to express complex concepts with a layout already prepared in the Slide Master of the deck, not optimized according to the needs of the content presented. The result is that people will watch the slide but they will lose interest, as they will not find any point of support, and therefore will only read it from top to bottom. However, no one wants to read the slides, and laziness makes us bounce from one side of the page to the other in an attempt to find a way to quickly catch the contents. 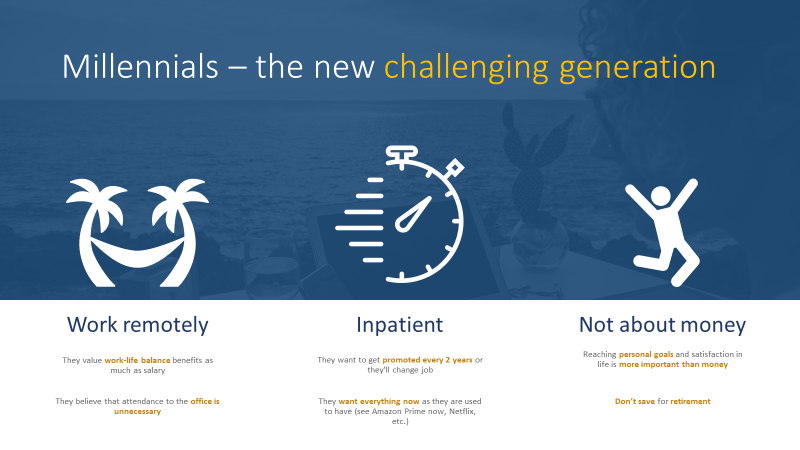 In the meantime, your audience is no longer listening to you; they are tired because they’re exposed to a great deal of information at the same time. This causes drowsiness and decreased attention. I tried to redesign the slide to show you the impact of the technique I want to talk about in this article. 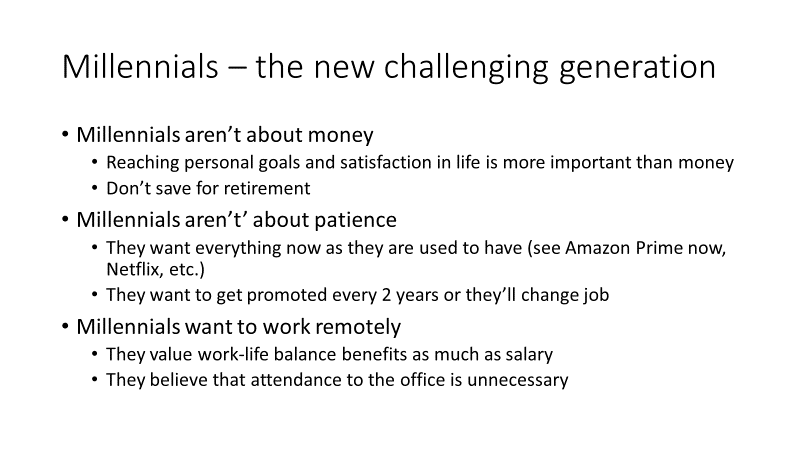 If you think about the starting slide of Deloitte, it could easily be a common layout, part of the everyday life of those who work professionally with PowerPoint. What do you think? 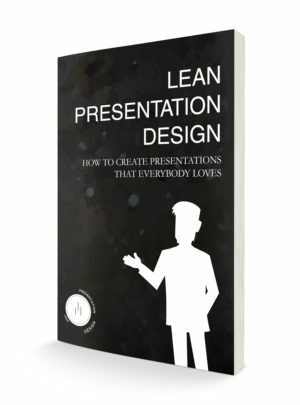 According to the approach of Lean Presentation Design, it is not important that it is more beautiful or ugly, only that it works better. I will show you blater why this design works better than the original. For the moment, I’m interested in teasing your curiosity. 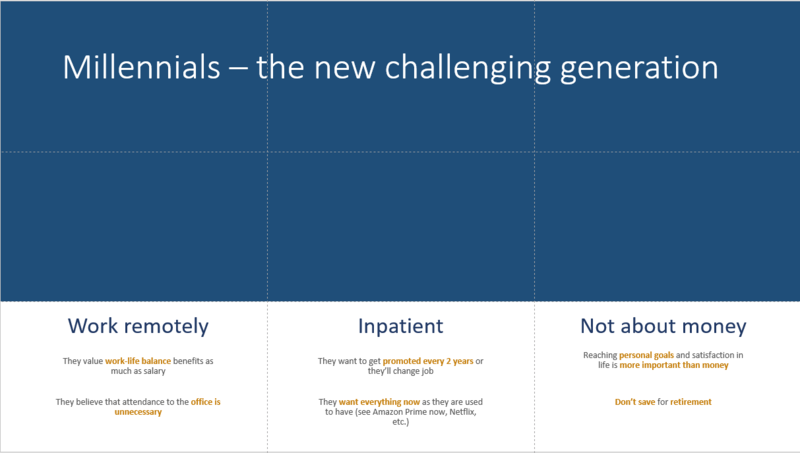 Redesigning this slide does not require any creative skill! How is it possible? 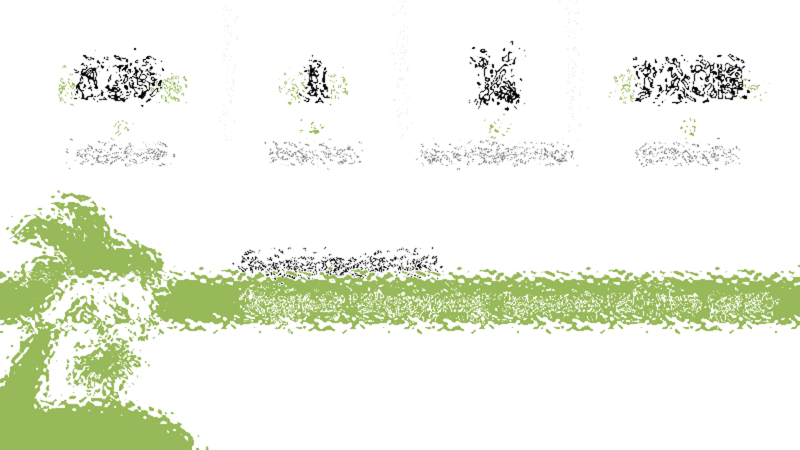 I know that you are not ready to believe me yet, but I can already anticipate that to solve the layout of Deloitte, it is really enough knowing only one golden rule: The Rule of Thirds. What is the Rule of the Thirds? The Rule of Thirds is a technique of graphic composition used for centuries in the world of painting and today widespread in the world of photography and film production. John Thomas Smith was the first to talk about it in 1797 in a publication called “Remarks on Rural Scenery”, in order to define a guideline for artistic compositions of landscapes. 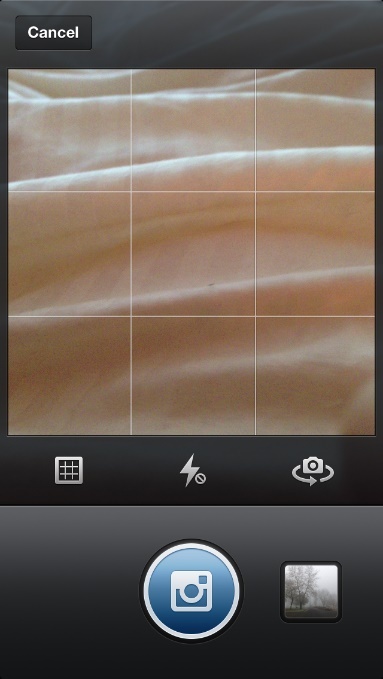 Have you ever noticed that grid check when you make a story or publish a picture on Instagram? The Rule of the Thirds consists of dividing the work area into 9 equal parts through the intersection of 4 lines, two vertical and two horizontal. Thus, 4 points of intersection are obtained, called PowerPoints! Every time I say this, something registers in the eyes of those who listen to me, enlightened in having discovered the reason for the name of the presentation software they’re likely using. The PowerPoints are the strengths of the graphic composition and, therefore, the points that attract the eye before any other element on the slide. 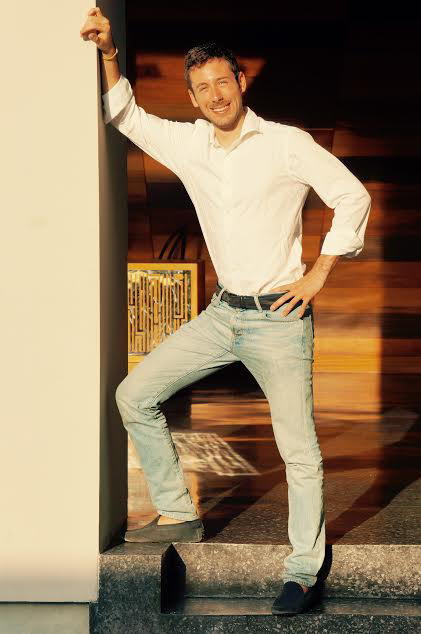 After all, if you think about it for a moment, all high-level professional photos never really have the subject in the center, it is always moved a little to the left or right, to be precisely centered on the chosen PowerPoint. Have you watched the 007 Casino Royale movie? Do you remember the scene where James Bond is poisoned and realizes it by looking at the poison in the glass? If you look at the framing, it’s based on the rule of thirds and focuses first on the PowerPoints on the left with the cocktail, and then on the right, where you find James (challenge: Add a comment to the article with the name of the cocktail and you could win a book on Lean Presentation Design!). At this point, it is quite clear that the 4 PowerPoints are located in fundamental focus points that attract the attention of the audience and that you will have to exploit for positioning your key messages. This is a better practice, but you don’t need to anchor objects exactly on PowerPoints, but at least around them. 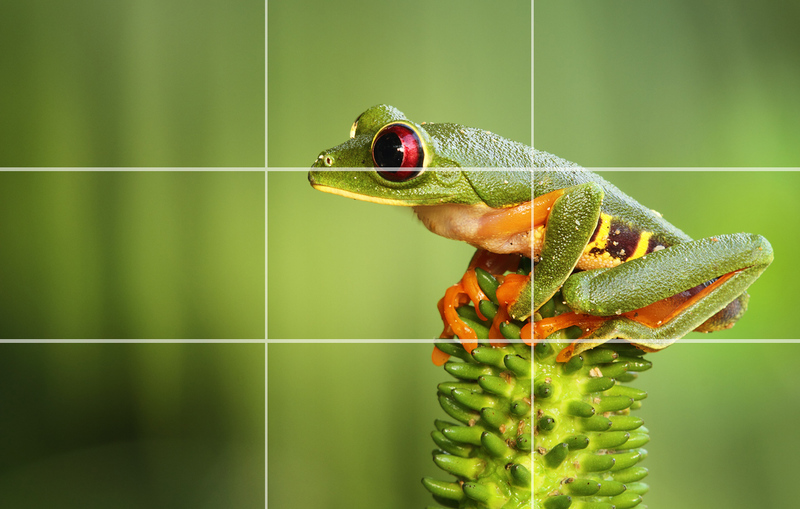 The Rule of Thirds gives us another great guideline: the composition of the image proportionally 1/3 and 2/3. In fact, if you look at the grid, you will immediately notice that the slide can be divided into one part that is twice the other, both vertically and horizontally. This allows you to organize content, especially when you have background levels, giving more importance to what remains in 2/3. 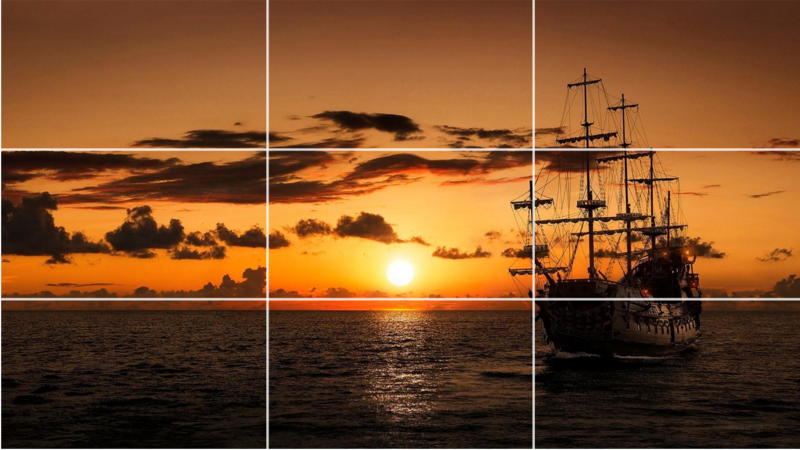 In the following picture, you see that the ship was placed on the PowerPoint of the right and that the image was composed by assigning 2/3 to the sky and sunset. Thanks to the use of the grid, it seems all more natural, more harmonious. The human eye tends to perceive harmony in the proportion 1/3 and 2/3. 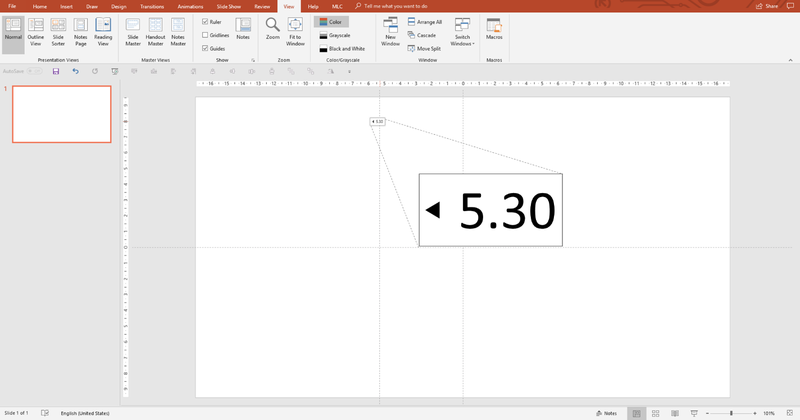 By using the Rule of Thirds in PowerPoint, your slides will be perceived proportional and harmonious, without using any more layout to the case or, worse, to the template. 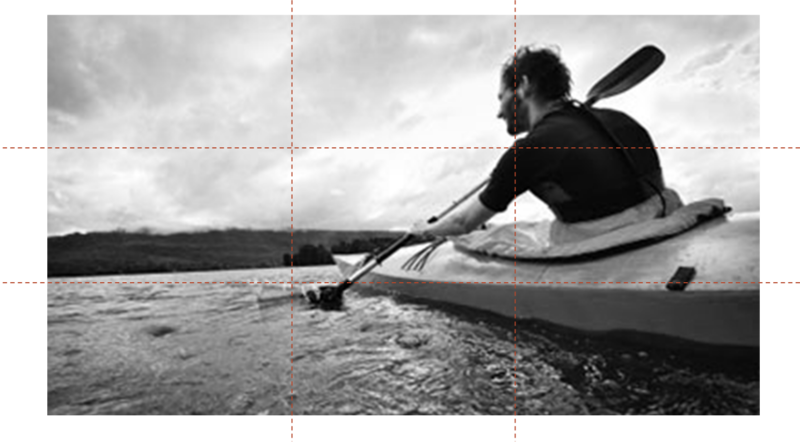 The rule of the thirds introduces dynamism into the slides. Think about it for a moment. If the subject of the photo were simply in the middle of the slide, it would be equidistant from all sides and therefore, once the focus was observed, they would not have a side to prefer where to go because it would have the same space everywhere. Likewise, with the application of the Rule of Thirds, the eyes start from the subject centered on the lateral PowerPoint and then they move on the rest of the slide. 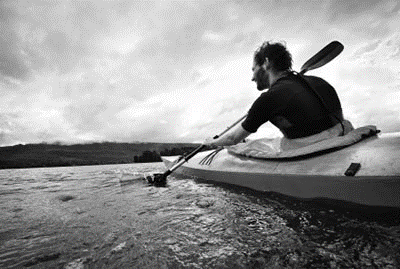 Look at the image of the kayak that follows. I bet you started looking at him, not the left part of the landscape. 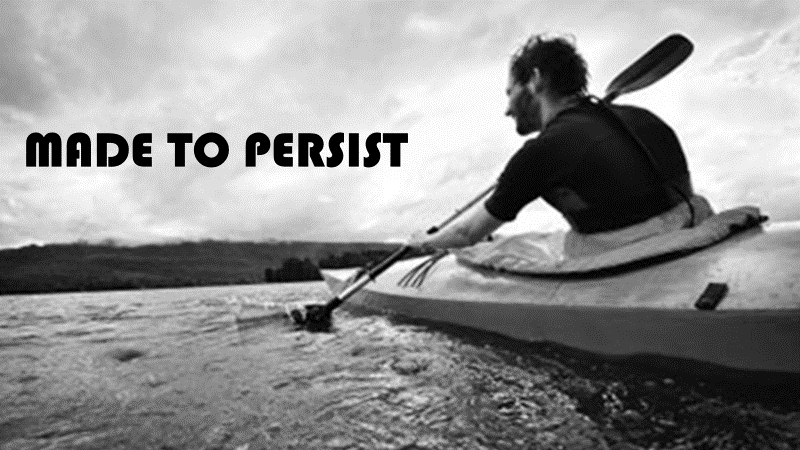 The fact that the rower is placed on the right third and that it goes to the left leaves room for the eye of the beholder to move from right to left, following him. For this reason, if you had a message to write, I would recommend you put it on the PowerPoint at the top left. Thus, the Rule of Thirds guides the eyes by attracting them to the PowerPoints, but also has the power to direct the gaze from one side to the other of the slide. Now that you know how it works, use it wisely. 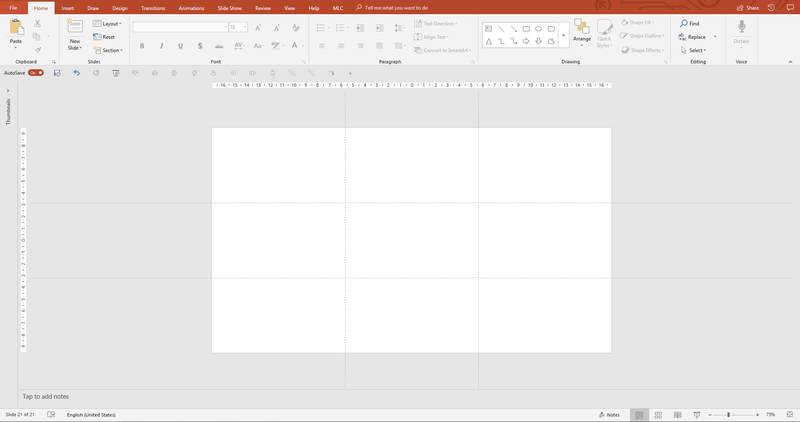 How do I set the Rule of Thirds in PowerPoint? It seems trivial but it is not. You will have to visualize, duplicate and position the guides precisely in the right place to reap the best reward. 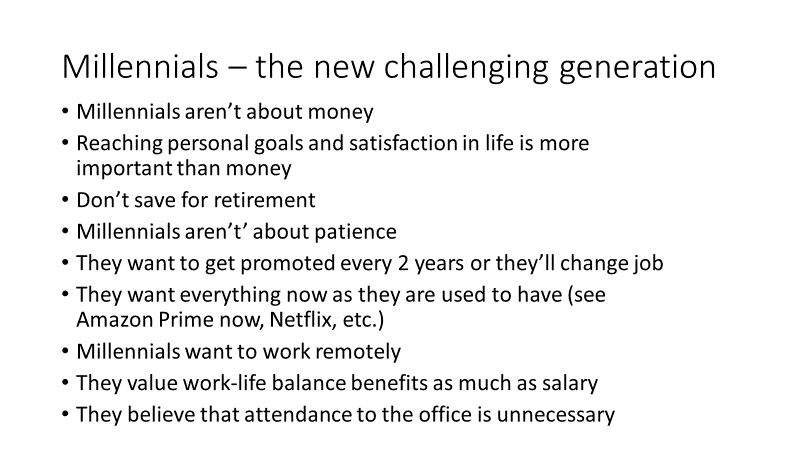 I ask my seminars how they would efficiently produce this in PowerPoint. No one has ever managed to answer me with an efficient solution (If you have already done some training with me, you’ve experienced it). First, you need to display the guides from the appropriate “view” menu. You will see two guides that identify the center of the slide to create the third division, but you would have to divide the slide into 8 equal parts, how do you know where exactly to leave the guide? First, to duplicate a guide, you must hold down the CTRL key on the keyboard while you drag it. While duplicating the guide, you will notice a small box with a number that indicates the exact point where the guide is located. The point is calculated relative to the ruler and the ruler works according to the metric system used by the computer you are working on. You could have vertical slides. 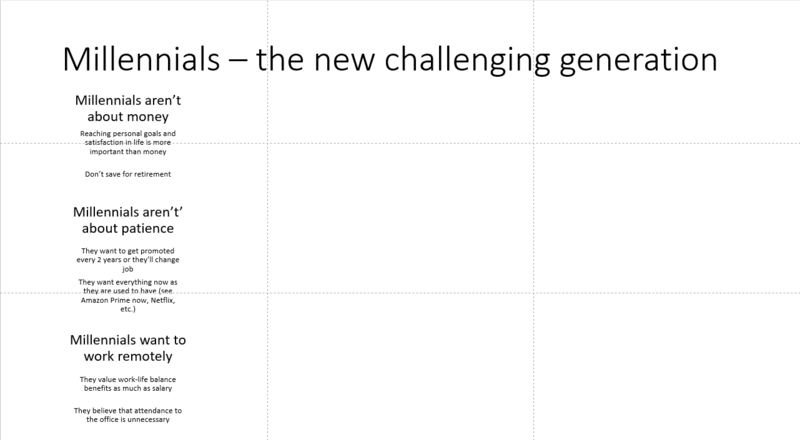 Maybe you’re drawing a brochure or the size of the slides would be a different ratio (4:3, 16:9, 16:10, etc.). It wouldn’t be helpful if I give you a numerical reference to where leave the guides; you’ll need a flexible rule. Drag the corners at the top left and bottom right, making the table the same size as the slide, changing the color of the table to give you a blank canvas, and thus, the slide is divided into thirds. Now drag the guides by holding down CTRL once for each guide you duplicate. 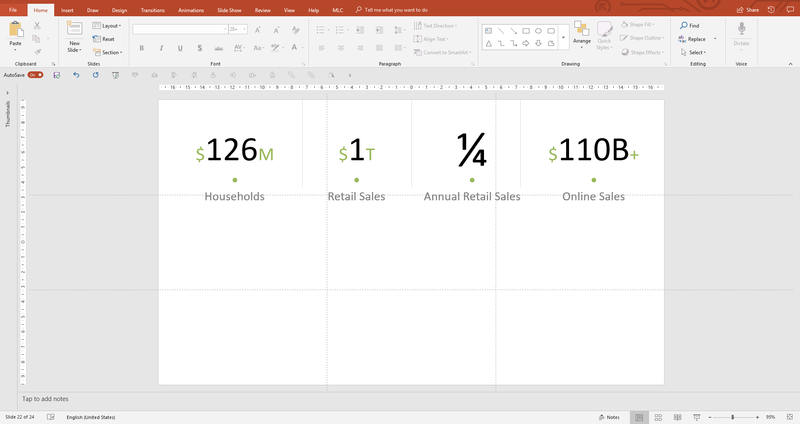 Place the guides, delete the table and here is your Rule of Thirds in PowerPoint. If you have installed MLC PowerPowerpoint addin, the Rule of Thirds can be activated by pressing the appropriate button. 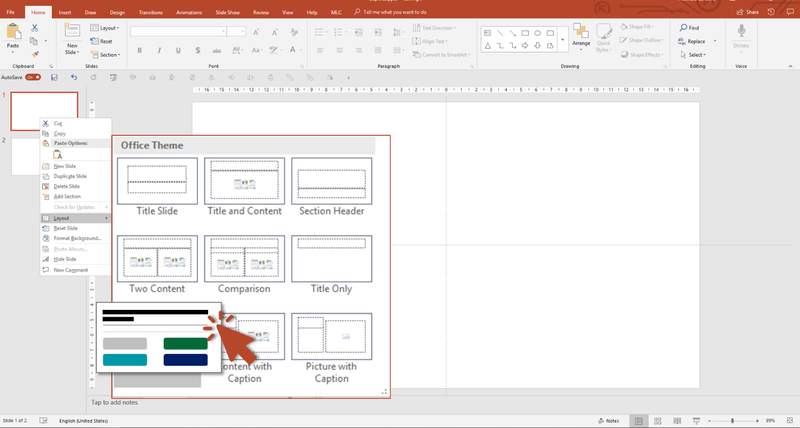 If you have not tried MLC PowerPoint addin yet, take advantage of this and try setting the Rule of Thirds in PowerPoint in a single click. The nice thing about addin is that, if at any time, you move the guides, losing the setup of the thirds, just click on the button to make them disappear and reappear in the correct position. You may find it cumbersome to work with the guides on sight, because you could mistakenly move them with the mouse and drag them, losing the proportions obtained. 1. 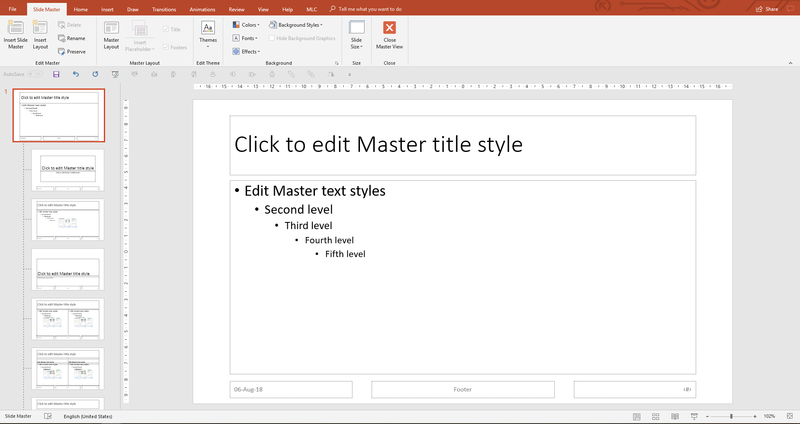 Access the Slide Master (Check the Microsoft Slide Master Tutorial to know the shortcut to access the Slide Master in PowerPoint). 2. Select the theme slide within the master to make sure that all layouts inherit the grid (the first slide of the master in the image below). 3. Repeat the procedure by creating the table as seen above. You will notice that in this case, the guides are orange, to stand out from those in the normal view. 4. Close the Slide Master and you will see the guides in normal view. You may need to drag the original gray guides out of the slide if you only want to keep the orange grids. 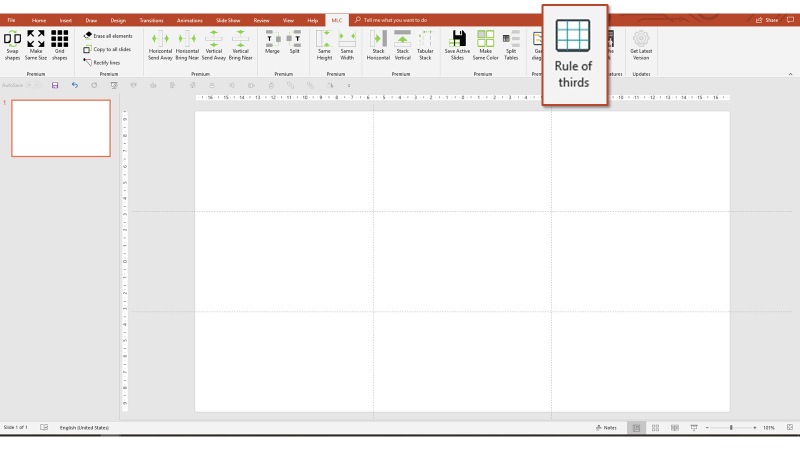 The Slide Master-set grids cannot be moved while in normal view, so the grids will remain active and always presented without the risk of dragging them by mistake. 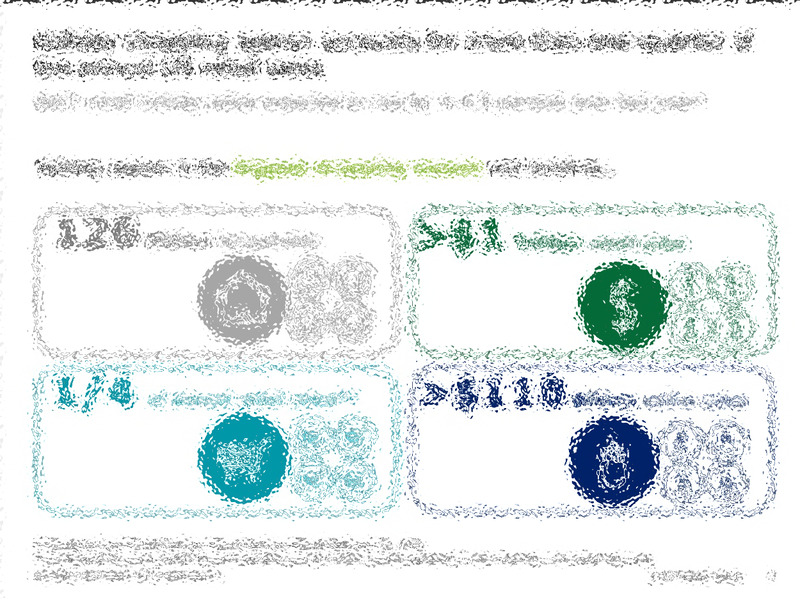 The only rule you should use to redesign the layout of Deloitte was the Rule of Thirds, and now you know the solution. How did I solve the layout with the use of a single graphic composition rule? I’ll explain it to you! Before starting to draw, I advise you to always analyze the information in front of you. 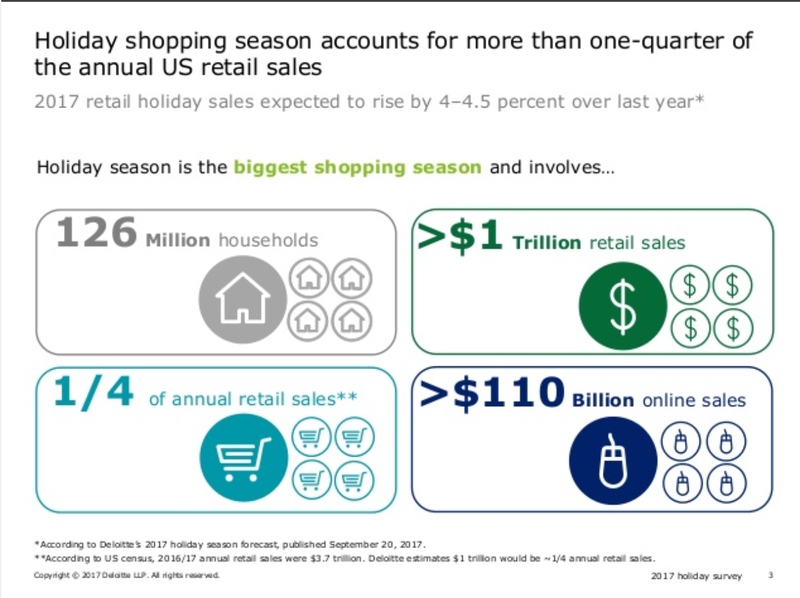 Looking at the Deloitte slide, it is clear that the presenter wants to communicate the importance of the holiday season for shopping. Information is also presented to support this statement. 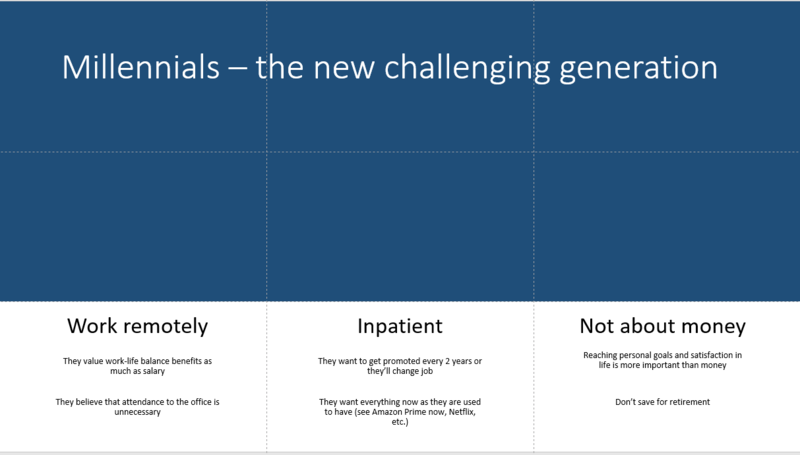 First, we set the rule of thirds and divide the content according to what we want the audience to see first. As you can see, I deleted the icons that did not add any value, and also removed all the colors. The use of colors, like any other element, must have a specific purpose and must be functional for the use of the content. In this case, the 4 numbers support the same message, so it is best that they are the same color, for the principle of “repetition” (Discover the 4 principles of graphic composition at the base of the presentation design). We introduce the key message, assigning it to the two lower PowerPoints. 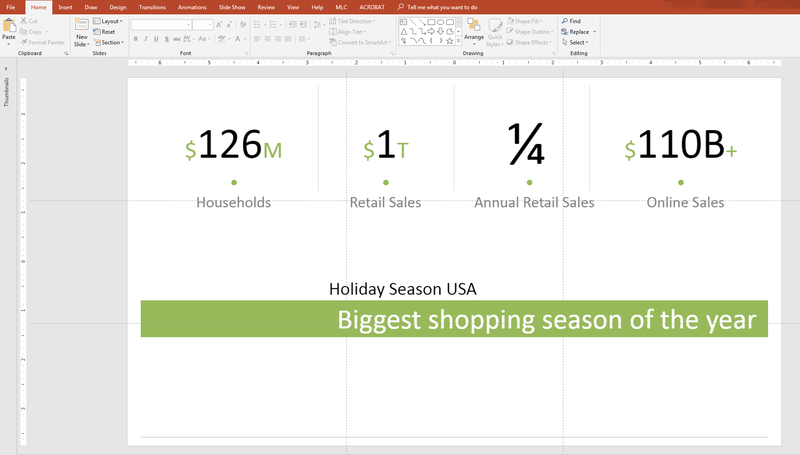 We recall the holiday season concept with a simple icon (Learn how to use icons in PowerPoint presentations). If you are curious about how I created the effect of white in continuity on the palm icon, share the article and ask it in the sharing text on Linkedin. It will be my pleasure to explain it to you! 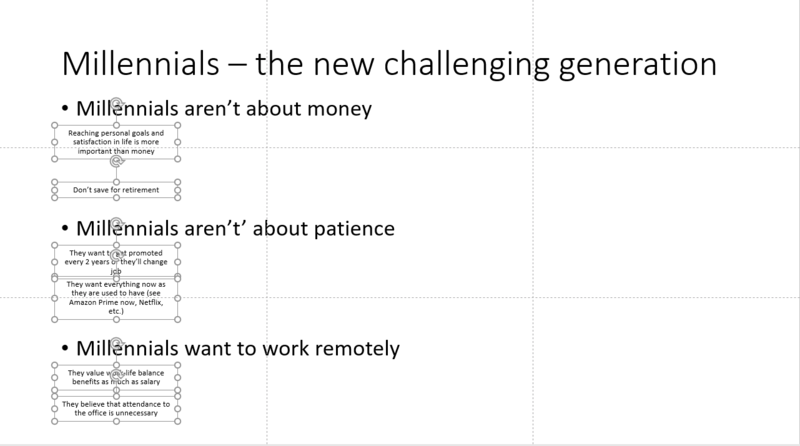 As you can see, the slide we redesigned communicates much better with the audience than the original one. You do not need any creativity to get this layout. Step by step, I showed you that the slide was obtained, not invented. 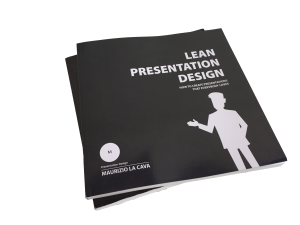 This is the basis of Lean Presentation Design – a rational approach to presentations. 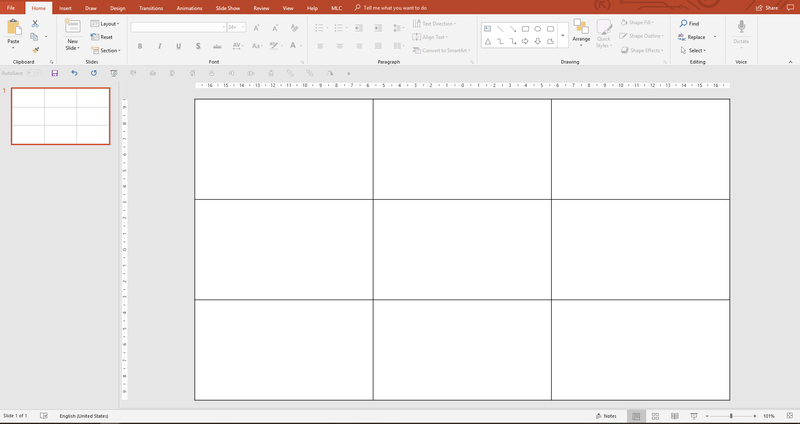 By now, it should be clear that the application of a standard layout taken from the Slide Master of the company template applied to any content can’t work. For this reason, I taught you to use the rule of thirds and optimize the layout of your slides giving proportionality and priority to content. How do you make sure you have correctly applied the rule of thirds by designing a really efficient layout for each specific case? I want to share a quick method to understand whether your slide works or not, simply by looking it. Have you ever heard of the “Squint Test“? Essentially, when you close your eyes most of the way and look at the slide, you should see everything a little fuzzy and only the most important parts of the layout should be visible. What stands out at first sight in your opinion? Surely the 4 blocks because of the size, the colors and the fact that they occupy 2/3 and maybe more than the slide. See the importance of proportions? Next I would say that the attention goes to the keyword highlighted in green, positioned immediately above the 4 blocks. This shows you the visual strength of keyword highlighting. It emphasizes the word(s) highlighted in your slide. In my opinion, highlighting the keywords is the best practice and should be used as often as possible, where obviously it is necessary to prioritize content and to guide the audience’s gaze. 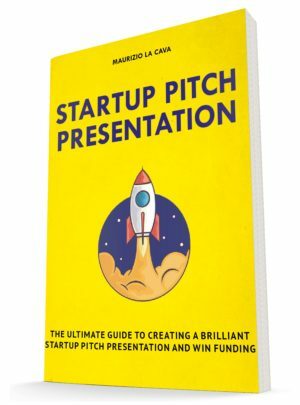 I suggest highlighting keywords in cases of self-standing presentations, full of text that are sent by email and left to individual use (without speech or speaker). In those cases, since there is no speaker who can help the audience, it is essential to optimize the path by highlighting the key words. Finally, attention most likely goes to the title and subtitle, distinguishable only by the difference in the color. This layout leads people to read from bottom to top, which is not natural, and the priority of the messages is questionable. Do you know the redesign I proposed, developed in thirds? We apply the Squint Test to the slide we have redesigned together. Where is your look? The attention falls first on the numbers, in my opinion, if you think about it, they are exactly the information that we are highlighting. For the principles of alignment and proximity, the glance immediately acquires the meaning of the numbers by reading the underlying comment label. The gaze, attracted by the lower third will promptly respond to the audience. See that thanks to the rule of thirds and an intelligent positioning of the contents I have also managed to reverse the sense of reading? In two quick steps, this slide communicates a message that, with its original design, it wouldn’t be able to communicate. Furthermore, thanks to the new organization of contents, the look will quickly return to the speaker, keeping continuity with the speech and a high level of attention. Consider that all these moments of attention I showed you happen in fractions of a second; people’s eyes go very fast. 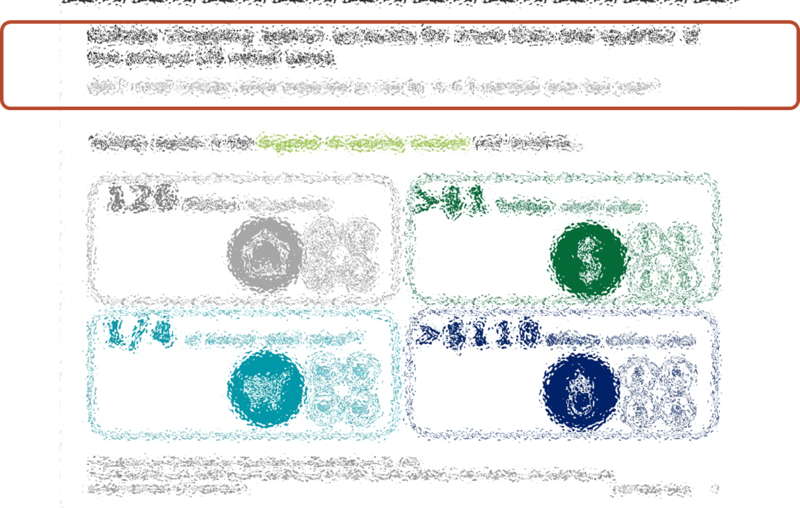 So even a single smudge or imperfection in design could make a slide totally ineffective. The rule of thirds applies itself well to the resolution of many layouts. During my training in the company, I always carry the application of the rule of thirds for the resolution of the infamous bullet list as an example. 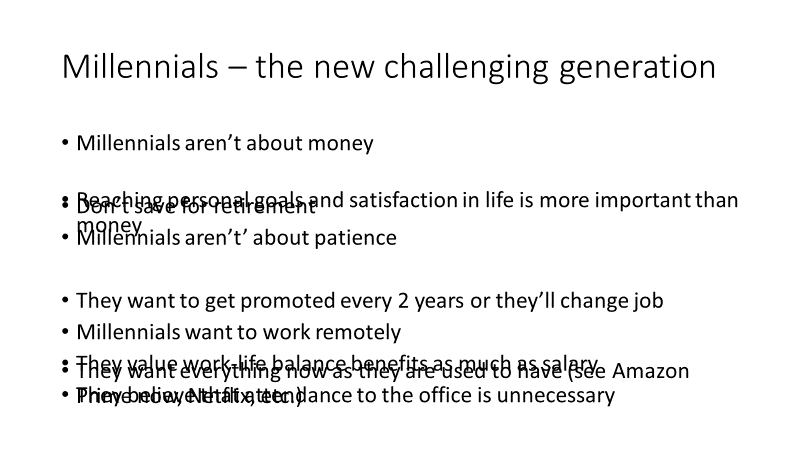 With a quick Squint test, it immediately becomes clear that this slide does not work. What can you distinguish? It all seems the same, right? 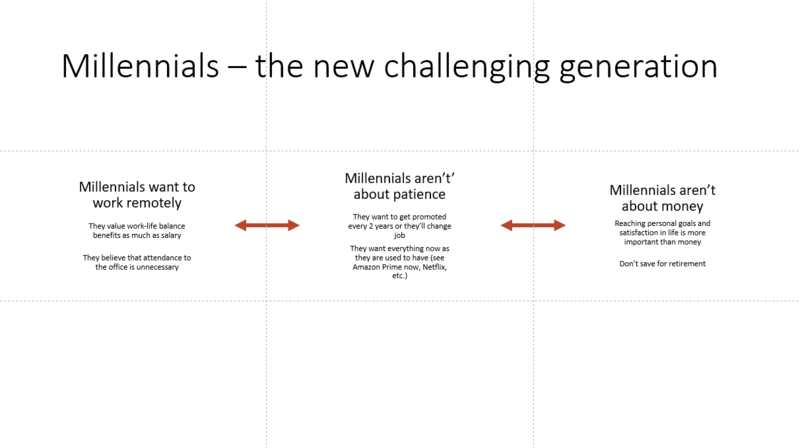 Let’s try to redesign this slide using the rule of thirds and giving a hierarchy to the contents. 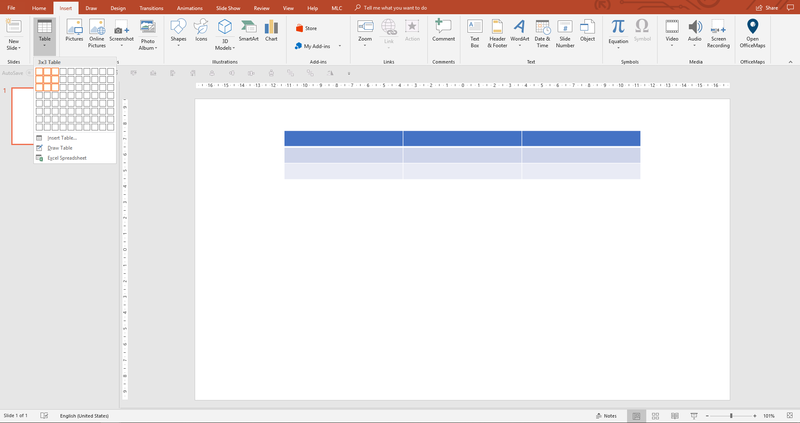 First of all, we break down the text of the main box into several independent text boxes in order to have the flexibility we need to reorganize the contents. To do this, simply drag the phrases from the text box to the slide in order to free them from the box in which they are all together. 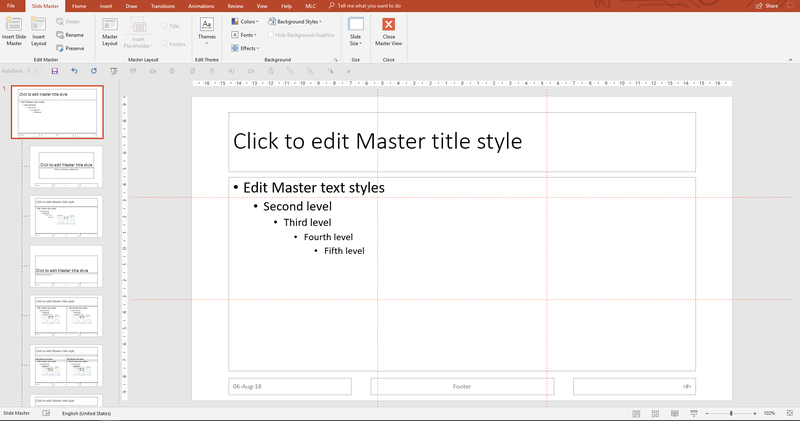 I will use the “Split” function of the MLC PowerPoint Addin for convenience. Just select the text box and click on the split function. 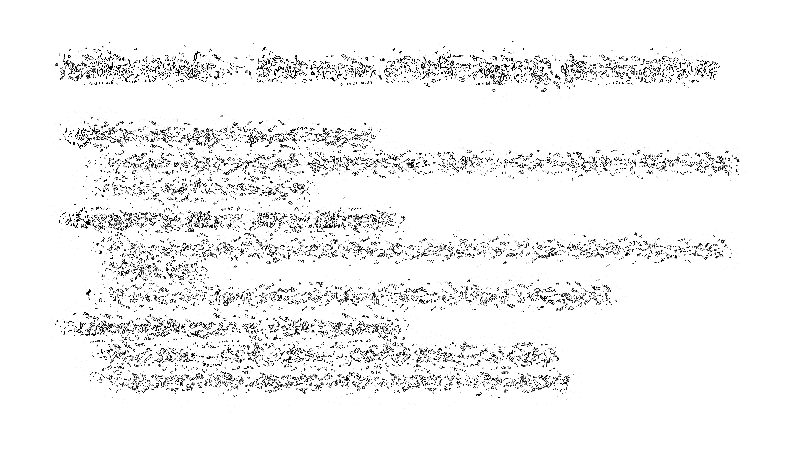 Each sentence of the original text box will be assigned to an independent text box. Now I use the “Stack Vertical” function (You don’t need it if you’re doing it manually). In your opinion, what is the first level of the reading? I would say that it is quite simple to note that there are 3 main points and 6 sub-points. Moreover, as illustrated in the guide of Neuro Presentation Design, human beings, at least in our part of the world, are horizontal rather than vertical readers. So let’s try reimagining this layout based on these considerations and the rule of thirds. We reduce the size of the underlays. We reduce the size of the main text. We group the 3 blocks in order to apply the Grid Shapes function and distribute them on 3 columns and one row. Even this step can also be easily performed by hand moving object by object and making sure to safeguard the alignments. Move the elements away while keeping the same space between them (so you do not have to redistribute them). Now we use the rule of thirds to compose a proportional layout. Then, I move the three points of the list to PowerPoint at the bottom and divide the slide into 2/3 and 1/3 with a colored cover. I also use the space available to define the size of the text in order to maximize readability. We apply the main color (blue) to titles and keywords. Are you wondering why I chose orange for keywords? Because orange is the complementary color to the blue of the cover; it maximizes the contrast and that it fits perfectly with the blue, creating harmony on the slide (Learn to use the colors in your PowerPoint presentations). 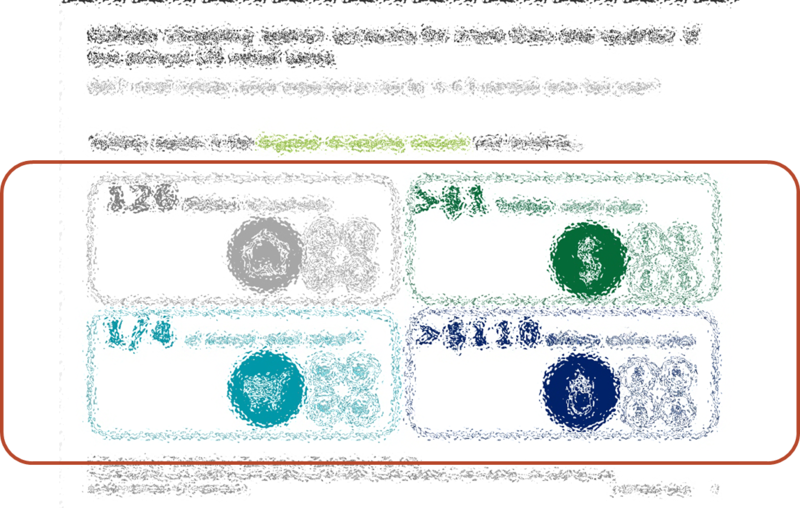 Since key messages remain etched longer if communicated visually, add icons. 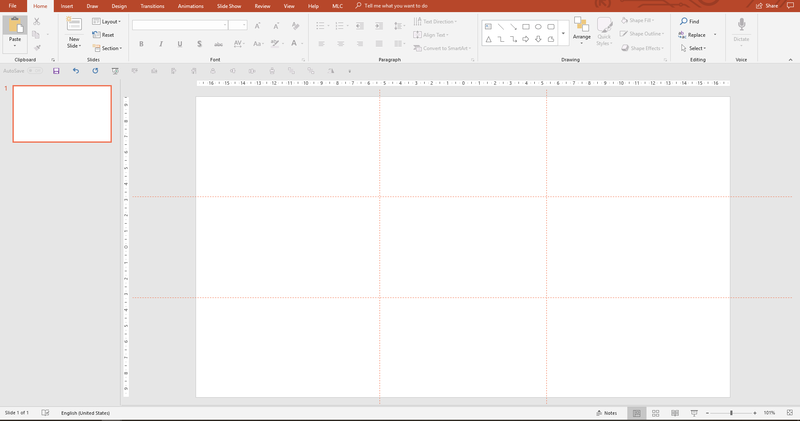 If you want to find out how to take advantage of the PowerPoint vector icons ,just click here. 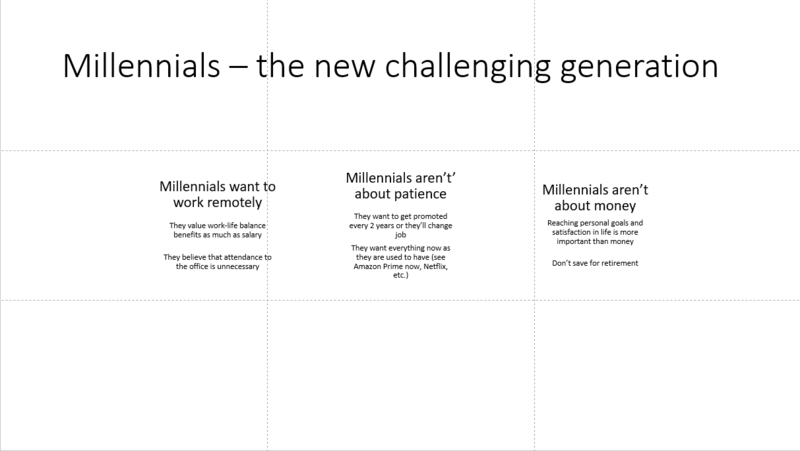 The slide is ready, but if you wanted to go further and add an additional visual appeal, you could add an image related to the Millennials behind the cover in transparency. I invite you to read my article on the images to learn how to create transparency effects and maximize the impact of your slides thanks to the use of high-quality photos. 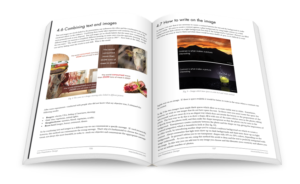 The Rule of Thirds is a powerful tool that allows you to solve complex layouts in a very short time, creating slides that communicate effectively with your audience. 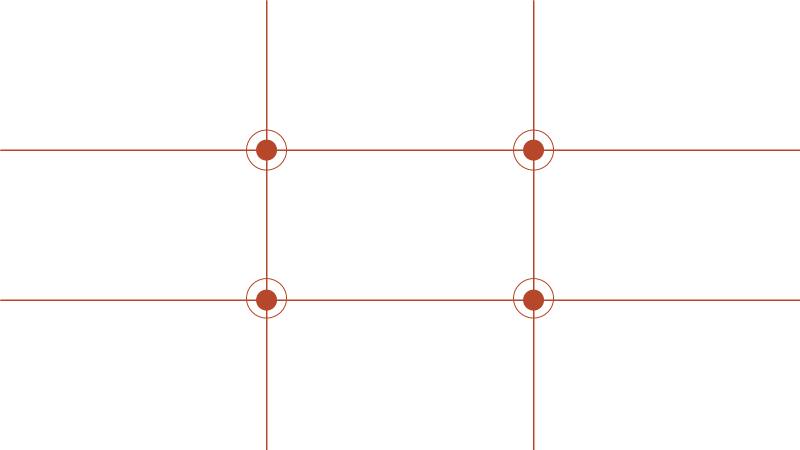 To set the Rule of Thirds, you can use the 3×3 table technique to obtain the position of the lines and the points of intersection quickly, or use the button in the MLC PowerPoint Addin to activate the Slide Master. If you found the rule of thirds useful, the next level is the study of human behavior at the sight of a slide, and how this can be influenced by neuro-marketing techniques (How to control the visual path of your audience in presentations with the Neuro-Presentation Design). Among the techniques, you will also find the rule of thirds. Share in the comments some of your applications of the rule of thirds which have revolutionized the effect of your slide. Use the rule of thirds to help your PowerPoint.